As summer approaches and it gets warmer outside, I start to get excited about wearing shorts, skirts, and dresses tights-free. Don't get me wrong--I love wearing tights, and I actually kind of hate summer weather, but I do love the freeing feeling of bare legs. I just hate the shaving that goes with it. The idea behind epilating is that it's a little shaver-like tool that basically tweezes your hair really fast. Since it pulls it out from the root, hair is supposed to grow back finer, and the results are supposed to be long lasting. It hurts. Like, a lot. What's great about it is that it's hypoallergenic, charges fast, and is intuitive when it comes to using. Basically, all you have to do is press the button to turn it on and go (once the epilator head is attached, of course). I probably should've read the instructions more thoroughly when I first started using it--there were so many different attachments, I wasn't sure which would work best. 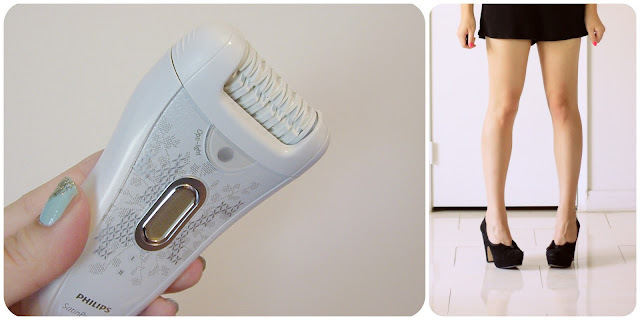 Tips: After some experimenting, I discovered that the epilator head and plain cap on its own worked the best. Don't press too hard, just glide it over your skin slowly and try to be thorough. It's GREAT for underarms! Seemed fine on my legs, but didn't hurt so badly on my underarms at all, and the results last for days. There's an attachment that has a "hair lifter", but it didn't seem to work that well. There's also one that has massaging bars to help stretch the skin and work with contours--good for the legs--but was unnecessary in my opinion. Also included is a shaver and trimmer option. The shaver is awesome! It has to be used on dry skin, so you can do it after showering. I love that you can just shave your legs really fast without hopping into the shower--perfect for rushed mornings. The illuminating tweezers (which seemed silly to me at first) turned out to be amazing. They light up, so you can see all those tiny hairs you usually miss on your eyebrows, and they're nice and sharp. The little carrying tube is pretty genius too, and has a tiny mirror on the inside. It HURTS. Worse that waxing. The first time I did it, it hurt so badly that I rushed through my legs just to get it over with. It seems to hurt the worst when I do my thighs. Feels like a strong stinging sensation when you run it over your skin. Skin is smooth after the first time, but there's this awkward hair growth phase in-between epilating that never goes away because hair grows in cycles. My legs look smooth, but feel just a little prickly as the hair starts to grow back. The dilemma is that you need it to grow back long enough so you can epilate again, so your legs will never have that just-shaved feeling for a long time. Not good if you have sensitive skin or are prone to in-grown hairs. I get the occasional one, so I try to exfoliate before and after. The Philips Satin Perfect definitely has its pros and cons. It's easy to use, but pretty painful. You also need to be thorough--it's annoying when I see that I've missed spots and have to do it again. I'll continue epilating to see if my hair does grow back finer. You're supposed to epilate less over time the more you use it, and some women swear by it. I'm also hoping my pain tolerance will get better with each use. Since it's more of a long-term thing, I'll update my review as I familiarize myself with the process. Have you tried epilating? What are your thoughts on it?